Debarun Curates opens at Southern Avenue exclusive designer store by Debarun Mukherjee. Thursday November 16, 2017: Kolkata got a brand new designer destination! 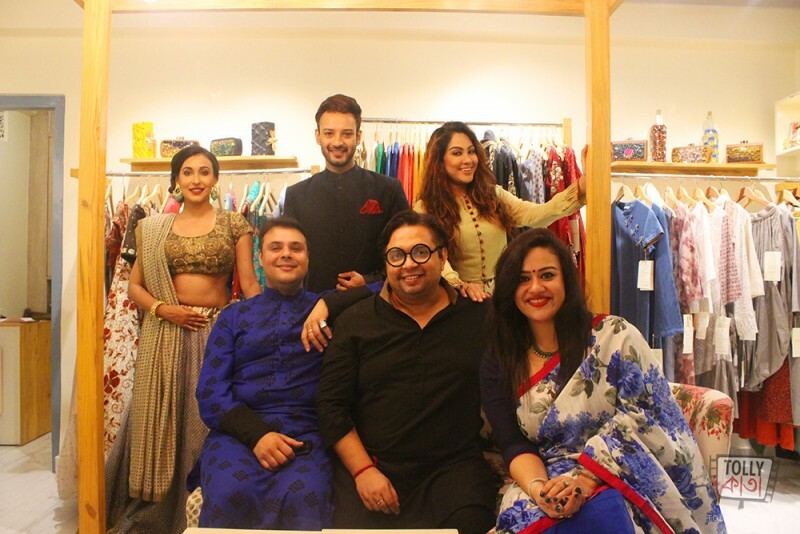 Renowned fashion designer Debarun Mukherjee launched his first bespoke outlet at 24B Lake View Road (Near Kamala Girls High School, Southern Avenue) on Thursday, November 16, 2017. Present at the occasion were celebrities like Sayani Datta, Shaheb Bhattacharjee, Chandrayee Ghosh and Sujoy Prosad Chatterjee, all wearing label Debarun Mukherjee. The store has been launched in association with Bikash Nahar of Nahar & Company. The 400 square feet store looks bright and welcoming painted in colours like ivory white, old gold, smoke grey and beige exuding European Classical flavour with a touch of minimalistic art. American pine wood has been used to create the racks with chairs in floral motif. The main focus area, is however, the centre of the atelier which looks like a “mandap” complimenting the celebration wear by Debarun. The interior design has been brilliantly done by Sandeep Sarkar, trained at the National Institute of Fashion Technology. Actress Sayani Datta looked resplendent in a hand embroidered zarodsi bridal lehenga while actor Shaheb Bhattacharjee rocked his look in a three quarter sleeved jacket in tussar paired with printed raw silk trouser. Sujoy Prosad Chatterjee carried the day look well in a hand woven royal blue block print kurta and black churidar. Seen in a different avatar, actress Chandrayee Ghosh was casually beautiful in a crepre raw silk floral jumpsuit. In its quaint setup Debarun Curates provides a holistic experience of fashion and lifestyle from tip to toe with an assortment of organic spa products under the name Auli Lifestyle by Aishwarya Biswas, handbags by Priyanka Baid and shoes by Aprajita Toor. Quirky and catchy gift items have been provided by the enthusiastic and creative team of The Traveller’s Den, who specialises in a huge range of off-beat products. Adding one more cap to its feather, Debarun Curates will also be one of the first stores to organise a pop-up fashion showcasing every month giving a platform to sustainable brands to exhibit their creations. For the opening month, social entrepreneur Namrata Manot will be presenting her brand’s collection from BIOME that uses natural dyed, bio-degradable fabrics and clothing. Debarun Curates is open every day from 11am to 9pm.